We are giving away a soft pink Bondi Band. This is what it looks like in black... remember though, ours is pink! Are you tired of wearing those teeny tiny little headbands that don't hold your hair back? I am! 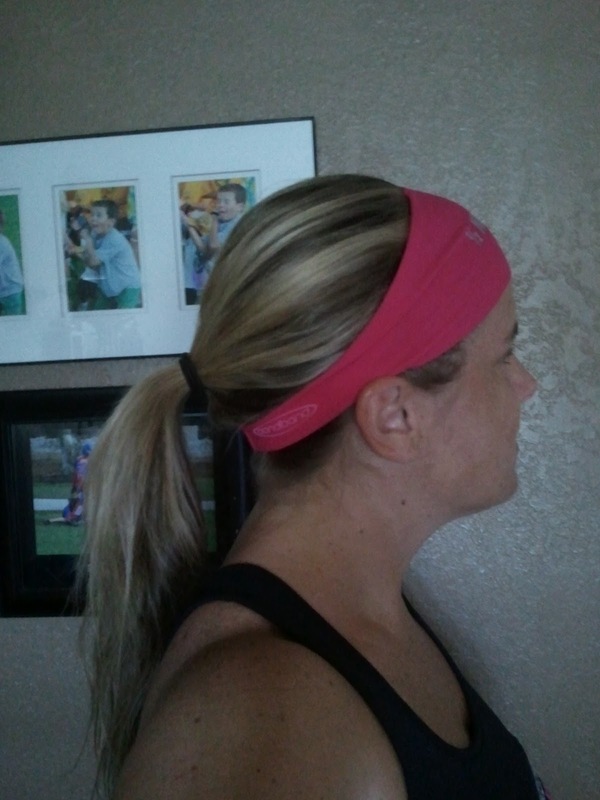 Although, I am not going to lie to you, there have been times that I enjoyed that I had to stop my workout to take down my ponytail and take off the stretchy band to get the hair to stay out of my face, BUT I shouldn't be stopping my workout for anything!!! Right? I started searching the Internet a few months ago, looking for some headband that would keep those fly-aways out of my eyes. That is when I found Bondi Band. They advertised that they are great for everyone. Their facebook page said that Bondi Bands are composed of a unique blend of nylon, lycra, and spandex. The result is a stretchy yet form-fitting band that holds up under the toughest hair style types. This intrigued me. About a week ago, Bondi Band sent me two of their bands. 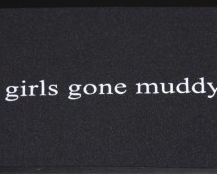 One said, "Girls Gone Muddy" and the other said, "!/2 Marathon Girl." I had to choose and that was tough because I wanted both. 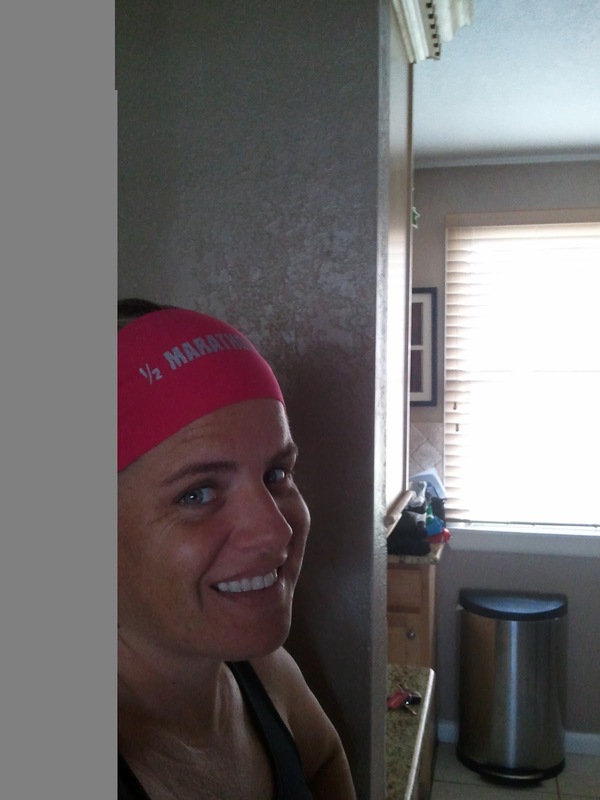 I decided on 1/2 Marathon Girl. I wore it on a long run and to two different boot camps. I loved how cool the material kept my head. I was also surprised that I didn't have to mess with my hair even once. (I didn't even have to fix my hair during push-ups...and believe me I was looking for an excuse to stop!) The fly-aways usually really both me when I am working out. Another big surprise for me was the fact that it wasn't hot at all. The material stayed cool, and it was lightweight. The wicking material did exactly what it was supposed to do. I was very surprised at how comfortable it was. So the "skinny" on Bondi Bands... They have many different products from armbands, to headbands, to hats. Their products are unisex, 100% American Made and perfect to be worn on their own or under other hats, helmets and visors. Using stretchy, breathable material, allows Bondi Bands to fit virtually every head size and shape. Their fashion lycra fabric is fun and great for every day. In warm weather, their “No Slip, No Drip” moisture wicking headbands are great to wick away sweat, keep hair back and ear buds in ears and in colder weather they are also great to keep your ears warm. Bondi Band donates 10% of pretax profits to Dana-Farber Cancer Institute. They also offer customized products. I have one band to give away... Be sure to DO all the steps that you say you do on the Rafflecopter. I will be verifying. Thank you! Be sure to do all of the steps. They will be verified. Thank you! I thought it was just the headband. I have to be honest I have never been a fan of the way the thick headbands looks but you make it look adorable, and it sounds like you really liked them. You've got me thinking I want to try one! Will I look like you if I wear one? I love my Bondi Band winter hat the best! It has a hole for your hair...love! I love the after not the before, just kidding!!! I would love to give it a try. Thanks!!! Totally getting some for winter running!!! I am so sick of using 10 clips to hold my bangs and fly aways back-would love to try the Bondi band!! Thanks for sharing your great find. I can't wait to try them. My hair is long and is so fine. A regular headband never stays put...these bondi bands look like they'd do the job ! Awesomeness, I tell ya ! These look great! I'd love to give them a try! Ohhh! These look great for workouts! I have long hair and would love to use this to pull it back! I never wear the little bands, my stylist said they break your hair and if she ever caught me wearing one she'd stop cutting my hair! I'd be willing to give these a shot!! Doesn't look very harmful! Oh...and my fitness bucket list, one of those things is to go rock climbing!!!! my fitness bucket list would be to RX all my WODS at my local crossfit box. on my fitness bucket list is to do a marathon. I have done one 1/2 and am signed up for 2 more 1/2's this year and next year I want to do a full. The "Goofy" at Disneyworld! Running both the Half Marathon and the Marathon on the same weekend! LOVE my bondi bands. Fitness bucket list : Disney world marathon as well as triathlon in Hawaii!!!! Fitness bucket list: Tough Mudder in Colorado!! Oh my... in Colorado? Why? Do you have family there or just want a trip there, or is there something special about that particular one? Yay! 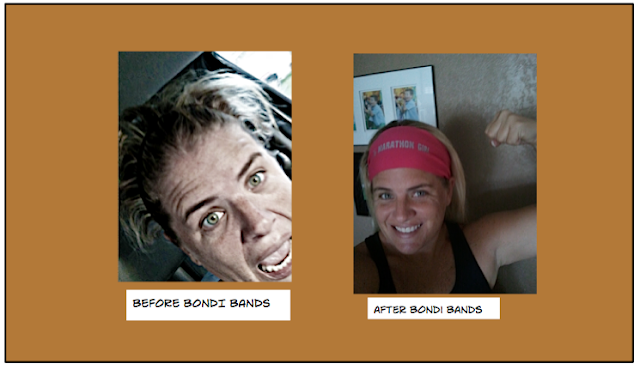 I love Bondi Bands! Thanks for the opportunity! I have a Chobani giveaway on my blog right now if you are interested!